Coronado’s longtime brewpub is full of cozy booths, neighborly chatter, and a local, friendly feel. 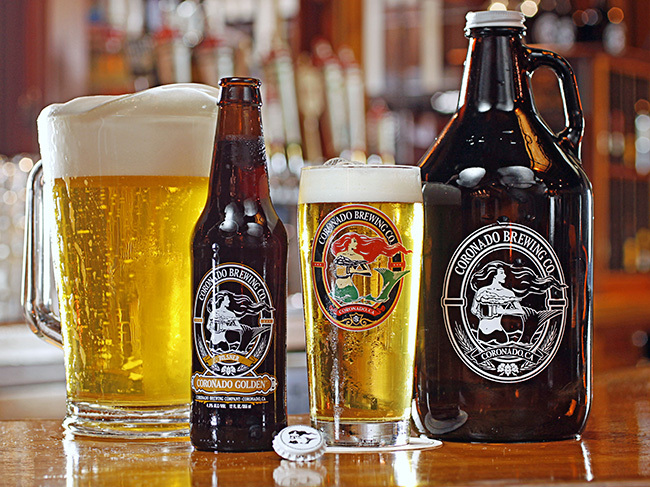 But the Coronado Brewing Company, celebrating its 17th anniversary (with a distinctive, intensely hoppy triple IPA) has become far more than a small town operation. 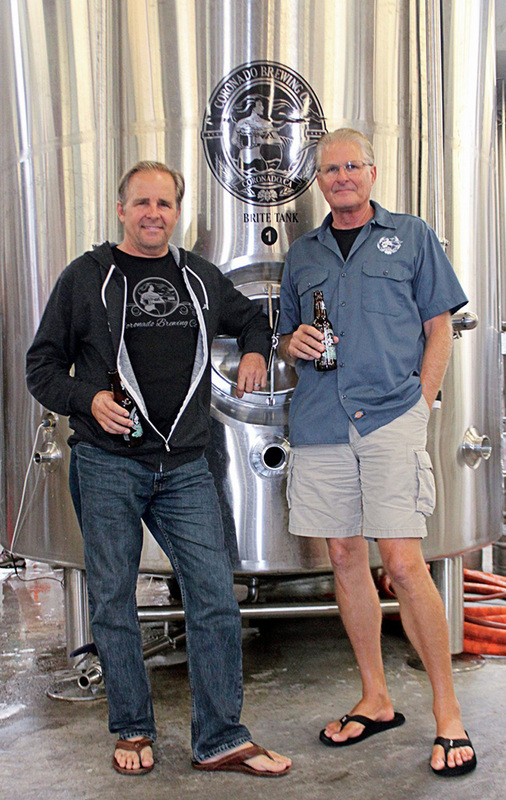 It may be one of Coronado’s favored family joints to grab a fish taco, burger, or pizza and some remarkably crafted beer, but word has spread over nearly two decades and co-founders and brothers Ron and Rick Chapman have gone from local to global in the exploding craft beer industry. CEO and co-founder Ron Chapman begins his story in the 1960s, when his family lived just around the corner on D Avenue. His father was a Coronado Junior High teacher and Coronado High basketball coach while his mother taught kindergarten through third grade in South Bay. Brothers Ron and Rick are 18 months apart in age. “Coronado was our playground when we were kids, even before the bridge was built; we grew up in the era of the ferries…” After college, Ron became a tennis pro and taught tennis for over 10 years. He also started a sports collectables business, selling 24K gold-plated trading cards on QVC and HSN and in many other retail markets. Meanwhile, Ron chuckles, “[Rick] was a big model in Europe and did a bunch of other stuff as well.” Rick explains that he modeled throughout Europe and Asia after being discovered while windsurfing in his college years. 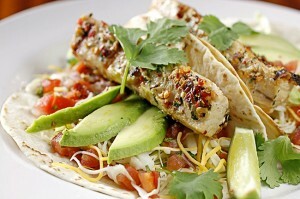 Eventually he and his wife returned home to Coronado to open and operate Café 1134 for 13 years. It was around that time, in the early 1990s, when Ron and Rick seized the opportunity to start a business together. Bula’s Pub & Eatery, the steak and seafood restaurant occupying 170 Orange Avenue, moved to the center of the village and the vacant property was listed for sale. The Chapman brothers knew they wanted to open a restaurant unique to Coronado. Microbreweries were just coming into fashion, with only six in San Diego at the time (today there are over 80), and they decided to open a brewpub. They purchased the property, researched the local beer industry, wrote a business plan, and raised money through local investors, family and friends. Shawn and Tim DeWitt, who were working at Café 1134, jumped on board as the third and fourth founding partners. CBC opened its doors in August 1996. Islander IPA, Mermaid’s Red and Coronado Golden were soon followed by Orange Ave Wit, Blue Bridge Coffee Stout and Idiot IPA. Within a few years, CBC’s beers were gaining momentum and bringing local awareness to Coronado’s brewpub. CBC was self-distributing and having a tough time keeping up with demand. 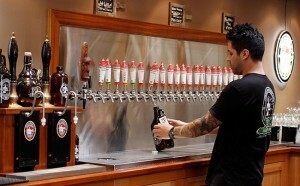 CBC then expanded its draft brewing to Mission Brewery in San Diego to supplement its brewing operations. 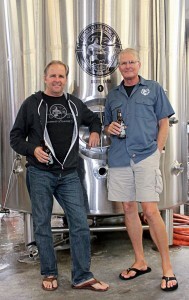 Stone Brewing Company became its first local distributor. In 2005, CBC bought the building next door, tore most of it down, and added 13 20-barrel fermenting tanks in addition to the existing three 10-barrel fermenting tanks. In doing so, they were able to create more capacity and brew all their beer for distribution in California, Arizona and a few other states. Today, MillerCoors and Budweiser have become some of CBC’s best distributors nationwide. “They saw the relevance and popularity of the craft industry and wanted to be a part of it, so they started to take on and distribute other craft beers in addition to their own,” Ron says. Although CBC works with national and international distributors, it has its own team of local, regional and national sales people who are constantly traveling and tapping into new markets. CBC continues to brew six core beers and over 15 specialty beers, including limited releases and collaborative brews created with brewers in other states and countries. CBC has become more of a family affair over time, with Ron’s sons and daughter and Rick’s stepsons all working and growing with the business over the past 17 years. Ron’s sons, Kyle and Kasey, started working at the brewpub as waiters during college. Kyle moved into management and acted as the GM for 10 years until two years ago when he moved over to distribution. “Our distribution business was growing so rapidly and we had a lot of branding and marketing needs. Kyle is very artistic and conceptual and we needed someone to run that division, so he got involved and started rebranding the product,” says Ron. Kyle redesigned CBC’s mermaid logo that now adorns the new silkscreened bottles, all packaging and merchandise, signage, brew tanks, and one of its local distributor’s freightliners. CBC’s Facebook and Twitter followers enjoy sharing “mermaid sighting” photos whenever they spot the mermaid on store shelves or at brewpubs nationally and internationally. Ron’s second son, Kasey, works full-time as CBC’s executive chef. 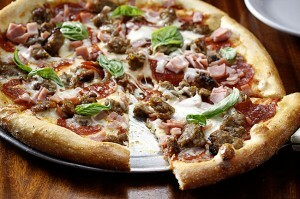 Kasey often expands his culinary finesse beyond the extensive gastropub menu to the brew room. Last year, Kasey and CBC brewers developed Thai-One-On Pale Ale with basil from the brewpub’s rooftop garden. Other ingredients include ginger, lemongrass, Kaffir lime leaves, and four varieties of hops. 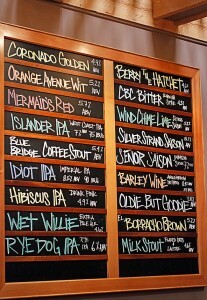 CBC’s new pumpkin brew is now flowing from the taps at the Coronado pub and new tasting room in San Diego. CBC recently purchased a food truck that will soon be hitting the streets for specialty events and stops at the tasting room. Coronado locals need not venture far over the bridge from their familiar barstools to experience CBC’s expansion success firsthand. 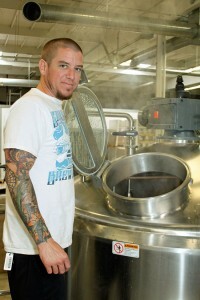 In August 2012, CBC began brewing at its new 20,000 square foot production facility and adjoining tasting room located at 1205 Knoxville Street in the Bay Park/Tecolote Canyon area. The Knoxville facility has a 70,000-barrel capacity, a new bottling line and plenty of room for growth. 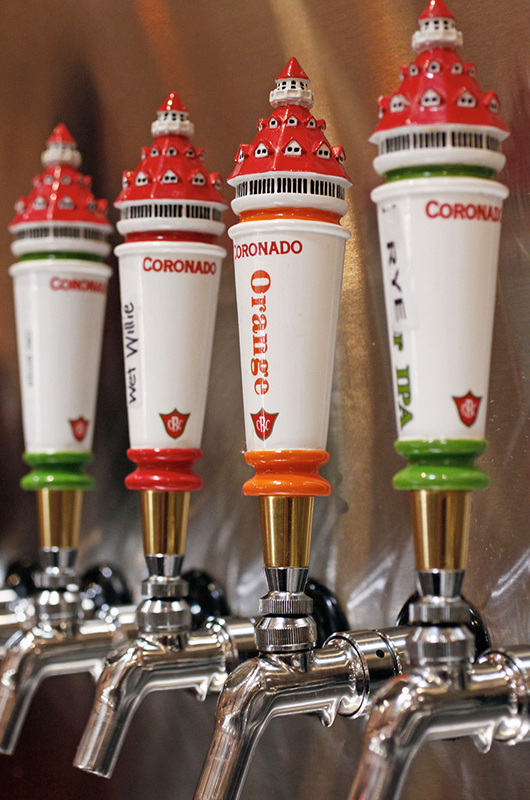 With four brewers, it serves as production headquarters for the core beers, allowing the two brewers at Coronado brewpub to focus on specialty beers. The tasting room has flat screens and plenty of bar and table seating and opens directly out to the action on the production floor. Tasters can sample the entire line of beers, grab a bite from one of the local food trucks visiting daily, and purchase six-packs, 22-ounce bombers and freshly filled growlers to take home. 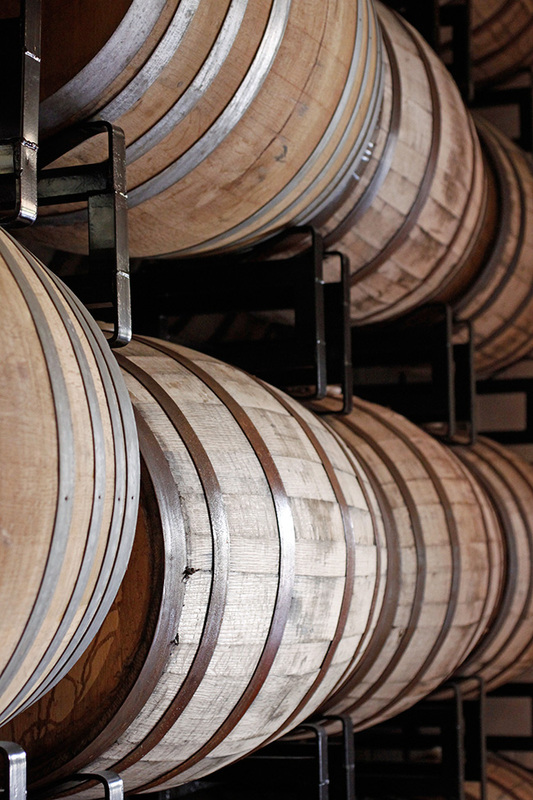 Knoxville is also home to CBC’s “Coronado Collection” barrel-aging program. The first release in 2011, Barrel Aged Barley Wine Ale, was a barley wine brewed with brown sugar and orange blossom honey and aged for six months in oak brandy barrels. One Beeradvocate reviewer says: “The aroma of this beer is pretty complex with brandy barrel elements blended with dark fruit, earthy spice, citrus and leathery malt. Some dry, earthy oak, vanilla and a really prominent brandy character. Some boozy sweetness with hints of molasses, caramel apple, date, fig and raisin followed by leathery malt notes and subtle spice. Smells great.” Although the barrel-aged program is still young, CBC plans to have multiple releases throughout the year, including Stupid Stout IPA aged in bourbon barrels and sour ales aged in wine barrels. Brewer Pete Falletta checks the “mash” in the mash tun, a vessel used for the first stage of the brewing process where the milled grains are mixed and rinsed with hot water to extract sugars. 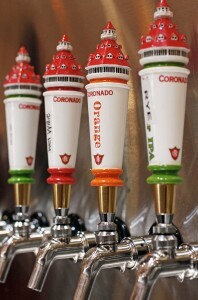 Beer taps at the new tasting room feature the iconic Hotel del Coronado. 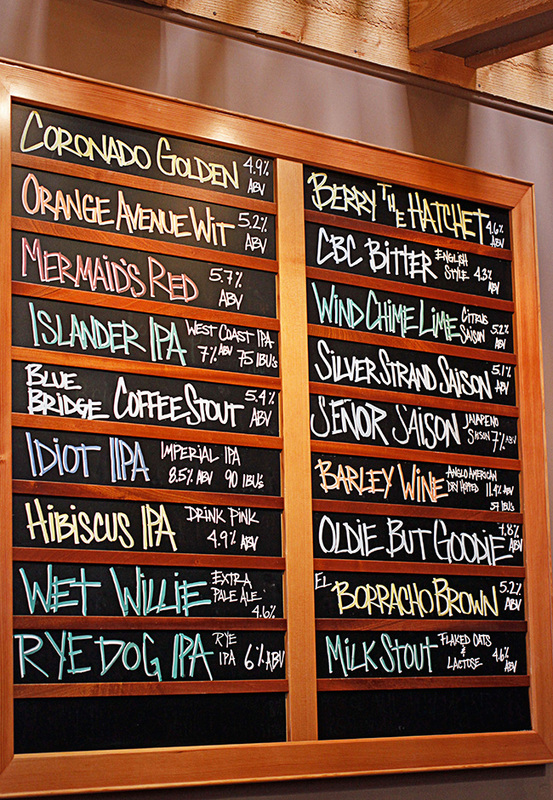 The beer board lists the new tasting room’s current offerings. 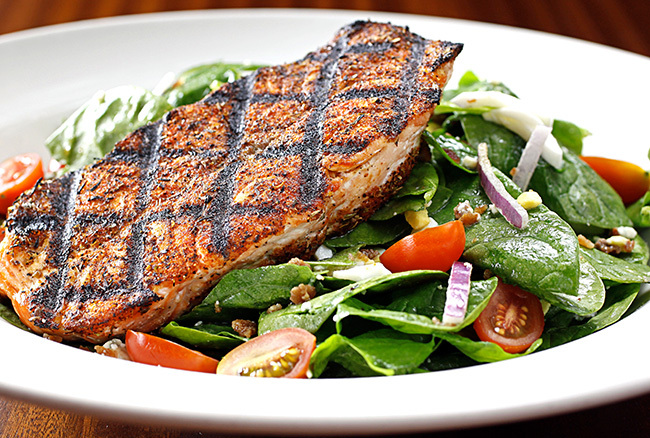 At Coronado Brewing Company’s pub in Coronado, menu samplings include Blackened Salmon Spinach Salad, Meat Lovers’ Pizza and Grilled Wahoo Fish Tacos.